I missed Saturday by so much guys. I had a busy weekend Amanda and Frosso came to town for IMATs, If you follow me on Instagram, you can see our adventures from the weekend and then on Sunday we had friends over for dinner and the Game of Thrones premier. But in an effort to keep up, I'm posting my look late. 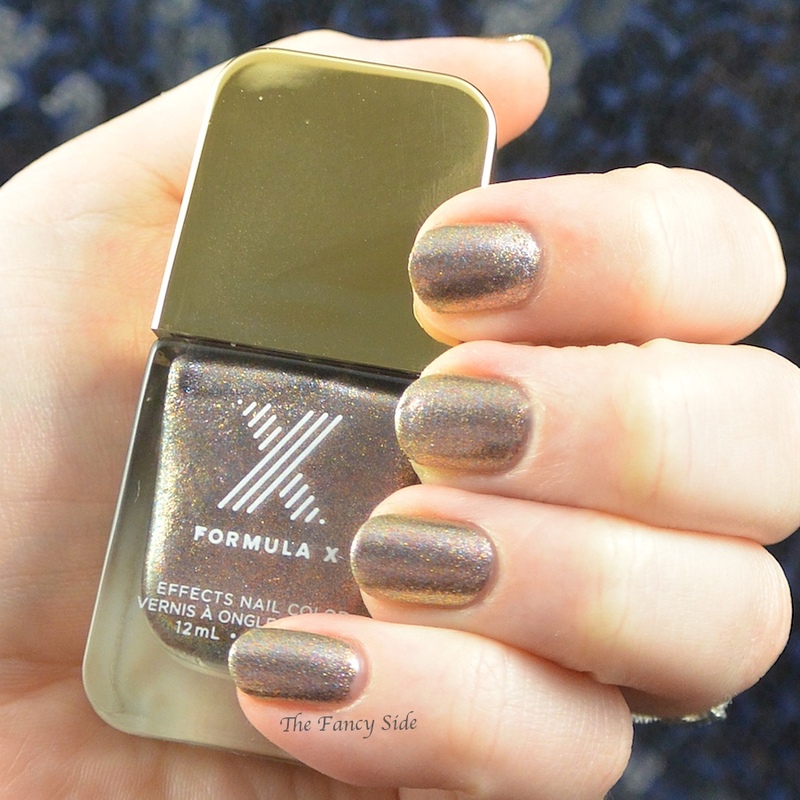 For the base of my look, I started with Formula X Alchemy. This polish is stunning. It's described as a "platinum infused mixed metal shimmer." It has an antique gold base, and I can see copper, blue, silver and pink shimmer in there. This polish is hard to describe. I'd call it a micro glitter, except the glitters are so fine, it's like the put micro glitter in a Ninja Bullit and chopped them up even finer. Two thin coats gave me this awesome coverage. 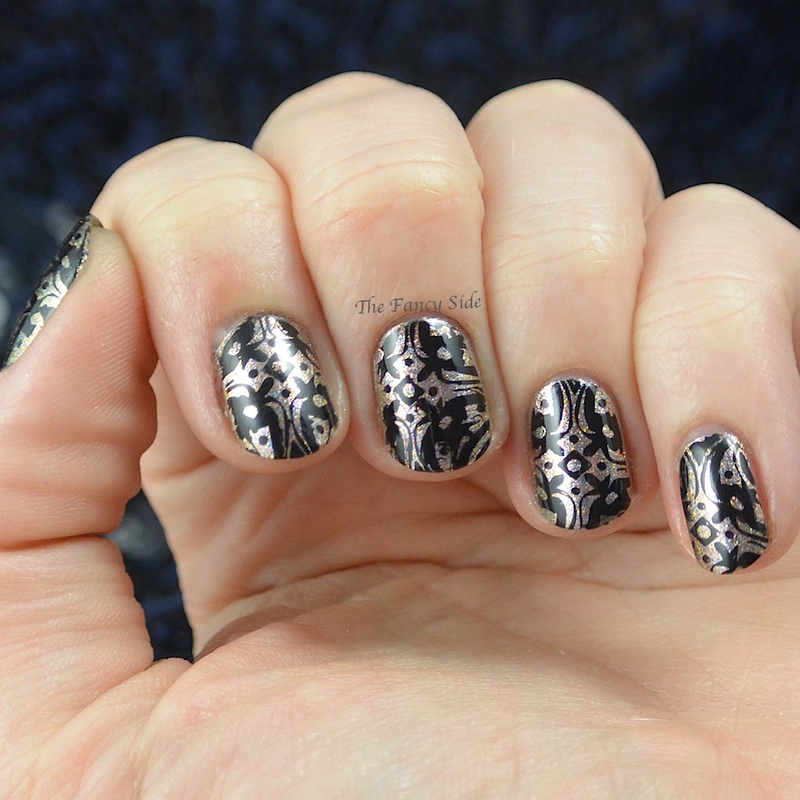 For the stamping I used Konad Black polish and MoYou London's Kaleidoscope 06. I really love how the stamp leaves just enough to still see the amazingness (spell check tells me amazingness isn't a real word, I disagree) of Alchemy underneath. There you have it. My late look. What do you think? Don't you just love Alchemy? Be sure to check out the other stamped looks below and if you like to stamp, join us! We're here every Saturday! I love polishes like Alchemy that are hard to describe. It's beautiful! Aren't they great? They seems so magical to me. That last macro is amazing! I really like Alchemy. Such a fantastic shade! Thanks Jenny! That is so sweet, I'm trying to step up my macro game! I really regret skipping this polish! I'll have to pick one up in a destash sale if I ever see it for a reasonable price. I grabbed it on a whim, I'm so glad I have it. Beautiful base color and lovely stamping design. OMG j'adore. That is all I can say. So much depth! Beautiful! Hope you all had a blast at IMATS! We did have a lot of fun! Thanks girl! Oh yes! Alchemy is gorgeous and looks great under your stamp too! That base looks super shiny, I love it! It is, I don't think you can go wrong with super shiny! Pretty mani, looks like you had a fun filled weekend! It was fun filled, but I feel like I need a weekend to recover from my weekend. Alchemy is gorgeous! Spell check just can't handle the amazingess lol! I'm glad you are on my side. Spell check is trying to ruin our fun! Amazingness is absolutely a word! I declare it! 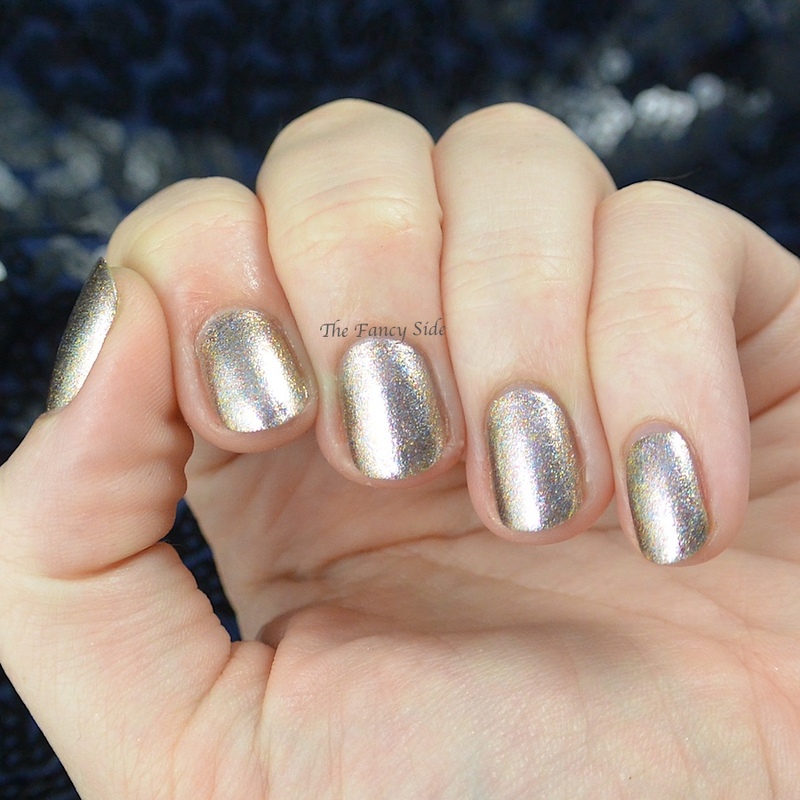 Because it's how I would describe this mani, pure amazingness! They'd better add it to the dictionary now! 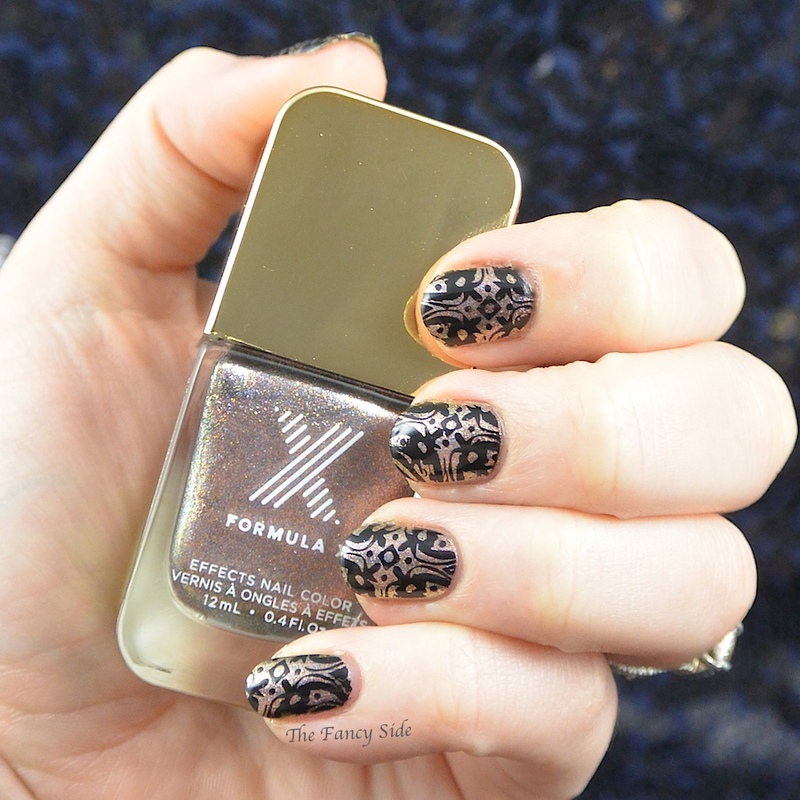 Stamping over chrome polishes is always a weakness of mine, this looks so beautiful. Alchemy looks really pretty and interesting. It is, it's crazy detailed when you get in close. This is gorgeous! That Formula X is divine! I can't agree more. So happy I bought it on a whim. Thanks Anita! That's so sweet! I've never been pulled enough to pick up any Formula X polishes but Alchemy is so pretty!! I love the stamping you added too!! I've gotten a few and been really happy with them, but I think you have to be selective in your choices. That's so sweet! Thank you!